I like folding knives. 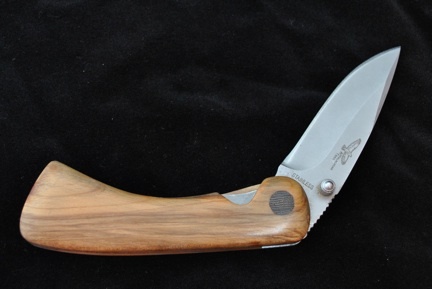 I am always on the lookout for folding knives from which I can easily strip the aluminum scales and replace them with pretty wooden ones. I particularly like the type with a frame lock where one side of the metal frame is bent inwards and upon opening the blade, it engages against a flat spot on the blade, thus locking it in the open position. To release the blade, simply push the lock to the side and close the blade. If the knife also has a thumb stud, the knife is easily opened and closed with only one hand. Knives with frame locks are not difficult to find, but it is a little tougher to find a small knife with a frame lock and a thumb stud. This one is 6-1/2″ long when open. I epoxied the scales in place and shaped them with rasps and sandpaper. I decided to leave the scales bare and polished the wood using tripoli and white diamond abrasive compounds. Wow, nice shaping, Chris. How did you apply the polish? Never done anything with diamond abrasive against raw wood. Thanks for the comment. I applied the abrasive polishes to a cloth buff mounted in my drill press. It is similar to a felt wheel, but has more give so it conforms better to contours. Chris, Are you referring to the Tapered Cotton Buffing Wheel 09A01.80 from LV? I use it with the carnauba and tripoli bars on my multiple-bit screwdriver handles (after a coat of mineral oil or boiled linseed oil). Any cotton buff should work well. I use the same ones you do – I have one for the tripoli and one for the white diamond compound. I’m glad that I’ve found your flairwoodworks.wordpress.com website. You definitely can write and teach and inspire. Keep writing – I’ll keep reading.